Little Anderson is a shallow dive site good for checking out buoynacy on divers that are new to the area. It offers a well protected area for divers getting their feet wet for the first time, or for those that have been out of the water for a long time. Little Anderson features an area that has many large clams scattered among the corals. 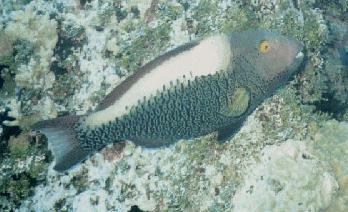 One of the residents of little Anderson is a hump headed parrotfish. This fish is unmistakable as it has a large forehead. Little Anderson is a small site but has alot to see. The boat mooring is parrallel with four bommis that reach 70 feet in depth. Start by exploring those bommies and work north to a set of bommies in 35 to 45 feet of water. From there, follow the reef back to the shallow area in front of the boat. There are several small coves worth exploring. Whaler Station is an interesting dive site with a set of bommies on one end and a very long wall on the other end. Along the wall below the bommies are numerous nudibranchs and sea whips. On the area of the bommies a banded anemone can be found. The wall structure of Whaler Station is very different in appearance from the bommie part of the wall. This part of the wall slopes down to the sand and has many varieties of coral (plate and staghorn) lining the wall down to the sand. This is a very nice divesite for a relaxed dive along a wall.